Published March 4th, 2010	in Money Saving Tools. 3 Comments	Tags: CouponFollow, RetailMeNot, Twitter. RetailMeNot took the coupons market by the storm when they launched in 2006 and ever since have been dominating the online coupons landscape beating the closest competitor by a wide margin (according to Alexa). How did that happen? The site relies on a number of dedicated toolbars users who feed the RetailMeNot database with enormous quantity of coupon codes that they stumble upon. This creates volume which in turn creates buzz and links. Links help RetailMeNot rank for coupon related terms on Google which in turn brings people to the website and drives the Alexa chart up, not to mention all the revenue that comes alone. It there a better way? Technology junkies may still be debating if Twitter as a company has a sustainable business model but some of the businesses who pipe the data that Twitter offers freely through its API seem to have no problem with figuring out how to make money. One of them is CouponFollow, a coupon code aggregator I stumbled upon when examining website leads to one of my projects. So what is CouponFollow? Are you familiar with StockTwits? The service sifts through the tweets and picks those that mention company stock symbols. CouponFollow is just like it but instead it picks tweets that mention coupon codes and sorts them by the store that offers the discount. How is it doing it? By searching for keywords like ‘coupon’, ‘voucher’ and analyzing the outbound link that comes with the tweet. So simple and so clever! The website launched October 7, 2009 and the November 30 press release mentions 150,000 tweets and 39,000 coupon codes analyzed. 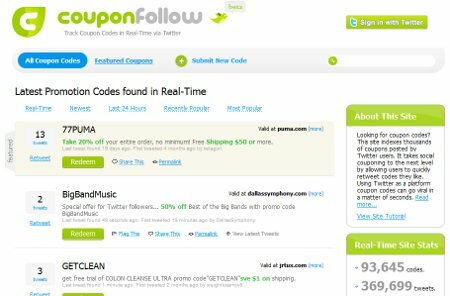 It is March 3, 2010 now and the sidebar shows 369,699 tweets and 93,645 codes which means CouponFollow has added around 55,000 coupon codes in just 3 months! This is the kind of volume that I am pretty sure even the coupon leader RetailMeNot cannot match. RetailMeNot relies on a group of toolbars users to get the coupons. Twitter has a much broader number of coupon junkies and guess what, they are eager to share them with the world! Effectively analyzing and organizing this data is all that it takes to beat RetailMeNot at its own game. What about that business model? If you look carefully at the tweets that CouponFollow rolls for you, they all are missing that outbound link. That is right, the link is replaced with a coupon code looking flash overlay clicking which is supposed to copy the code into clipboard and redirect to the source. Does it remind you something? Yes, this is how most coupon sites including RetailMeNot organize the coupon pages! I have not taken time to analyze what CouponFollow does with the links but I did encounter pages like this when clicking on some of them (which is an expired page at Commission Junction, a popular affiliate network) so it is quite possible that CouponFollow stuffs some of their own affiliate cookies into those links. Update 03/16: Marc Mezzacca of CouponFollow.com emailed me to inform that his company is not engaged in “cookie stuffing” or “link stuffing” activities. Is this legal? Since CouponFollow doesn’t own the tweets can it still modify them to earn a commission? I am not a legal expert and so will not even try to guess but there is something shady about doing business this way. I built an aggregator website myself and believe me I had to go through all the intricacies running a website like this implies. Modifying data you don’t own is not a very smart business decision. “RetailMeNot relies on a group of toolbars users to get the coupons”. RetailMeNot doesn’t work that well… they miss a lot of good coupons because it all seems to be automated, without much manual review. I’m starting a coupon website and I don’t know how to compete with those two companies. I am doing everything manually because I think it is better for SEO. However, I don’t know if I can rank for keywords if they post that many coupons at a time. Jeff, many coupon websites rely on “coupon feeds”…I don’t know about a tool bar but the data feed imports coupons so there is no manual labor.